Cebgo, the Gokongwei-led budget carrier announced it will mount daily flights between Cebu to Ormoc, Cebu to Roxas and Cebu to Calbayog starting November 19, 2016. Cebgo said the three routes will use ATR 72-500 aircraft. “Cebu Pacific remains steadfast in providing the best connectivity options for passengers at lowest fare in the market. With the additional routes in and out of Cebu, the Queen City of the South, more guests can travel and visit scenic spots in the Visayas region. We will continue to expand our reach that will cater to our valued guests and boost trade and tourism agendas in the destinations that we operate in,” Paterno S. Mantaring, Jr., Cebu Pacific vice-president for corporate affairs, was quoted as saying in a statement. The addition of the three new routes will bring to 25 the number of Cebu Pacific’s domestic routes from Cebu. Aside from Cebu, the airline also operates flights out of its hubs in Manila, Davao, Clark, Kalibo, and Iloilo. PHILIPPINES AirAsia Inc. announced that Captain Dexter Comendador has been named interim chief executive officer effective July 30. He replaces Joy Cañeba, who resigned after three years in the company. Captain Comendador has over 34 years of experience in the aviation industry as officer of Philippine Air Force and commercial pilot for various airlines. He joined Philippines AirAsia in 2011 as director of flight operations and was promoted to chief operating officer in 2015. National carrier Philippine Airlines expects 2016 to be a profitable year despite increasing competition and overcapacity. At its annual stockholders meeting held yesterday at Century Park Hotel, Manila, PAL president and chief operating officer Jaime Bautista (right) said the flag carrier posted a net income of $132.73 million in 2015, 35 times the $3.80 million recorded in 2014. 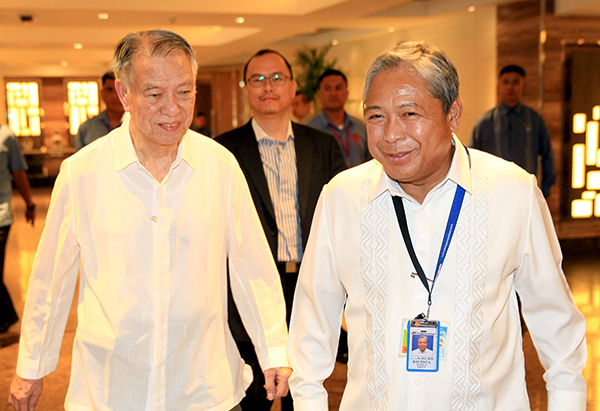 Also in photo is PAL chairman Lucio Tan.